Although many past studies have invoked buoyancy forcing at high latitudes as the driving mechanism for the overturning […] wind forcing―by creating surface mass fluxes and/or by providing the mixing needed to return deep waters to the surface―is instead the dominant mechanism (14). […] 14. C. Wunsch, Science 298, 1179 (2002). Wunsch, Carl (2002). What is the Thermohaline Circulation? Science 298, 1179-1181. […] the deep ocean is in a near-equilibrium state, and it is not possible, without an intricate calculation, to determine if the density/pressure differences drive the flow field, or the reverse. Some authors claim to be able to separate the fraction of the flow derived from density field gradients from that caused by the wind field (definition 6). But the density gradients are set up primarily by the wind. The only possible sources of this work are tidal stirring and the wind field […] a convective mode of motion cannot generate the turbulence required to carry the MOC across the stable stratification. The conclusion from this and other lines of evidence is that the ocean’s mass flux is sustained primarily by the wind, and secondarily by tidal forcing. Both in models and the real ocean, surface buoyancy boundary conditions strongly influence the transport of heat and salt, because the fluid must become dense enough to sink, but these boundary conditions do not actually drive the circulation. The ocean is thus best viewed as a mechanically driven fluid engine, capable of importing, exporting, and transporting vast quantities of heat and freshwater. Although of very great climate influence, this transport is a nearly passive consequence of the mechanical machinery. When Stommel (10) first introduced the term “thermohaline circulation” in a box model, he explicitly provided a source of mechanical energy in the form of mixing devices. These devices disappeared in subsequent discussions and extensions of this influential model. For past or future climates, the quantity of first-order importance is the nature of the wind field. It not only shifts the near-surface wind-driven components of the mass flux, but also changes the turbulence at depth; this turbulence appears to control the deep stratification. The wind field will also, in large part, determine the regions of convective sinking and of the resulting 3D water properties. Fluxes and net exports of properties such as heat and carbon are determined by both the mass flux and spatial distribution of the property, and not by either alone. The term “thermohaline circulation” should be reserved for the separate circulations of heat and salt, and not conflated into one vague circulation with unknown or impossible energetics. No shortcut exists for determining property fluxes from the mass circulation without knowledge of the corresponding property distribution. Let’s see how the distribution of ozone in the winter affects the circulation. Can be seen low temperatures in Alaska compared to January. Can be predicted to circulate for five days. Basically, the jet stream will run along the edge of the yellow area. You can see that frost will return to the south-east US. The temperature also falls in Europe. Circulation in the Eastern Pacific is substantially constant throughout the winter. Hence the high ocean temperatures in this region. Rial, J.A. (2012). Synchronization of polar climate variability over the last ice age: in search of simple rules at the heart of climate’s complexity. American Journal of Science 312, 417-448. […] in an unusually scathing critique of scientiﬁc consensus, Wunsch (2010) suggests that the great ocean conveyor, the signiﬁcance of repeated freshwater hosing numerical experiments, and many seemingly supporting results from climate models must all be called into question. A one-stop-shop comparative catalog of climate symmetries might help modelers get real about wind. There’s a direct analogy between orbital & multidecadal timescales. I’m digging through the literature to determine the fundamental roots of misunderstandings that are preventing expedition. For example, why can’t Curry & Mann understand a simple geometric proof? Why can’t climate modelers constrain their models to be consistent with key properties of earth orientation parameters? I agree with Wunsch that it’s a multi-disciplinary education problem at the root (dramatically complicated, of course, by (at times severely vicious) political interference). Community Alert: There are some patently & profoundly incorrect things being said about Milankovitch theory at wuwt. Sometimes when people get soaring on a wave of hubris they don’t know when to stop (and double-or-nothing every-time no-matter-what ends up bust). A lot of irreversible credibility damage has now been done. Bill Illis is probably the only trustworthy commentator on the subject at wuwt. It’s to the point where wuwt should issue retractions. If it’s the case that “There are some patently & profoundly incorrect things being said …” then it’d be best dealt with directly yourself as you doubt anyone else’s credibility, trustworthiness, or smarts. […] what was the major change between the glacial period and the Holocene? […] the disappearance of the Laurentide and Fennoscandian ice sheets. In effect, two enormous mountain ranges of high albedo, nearly bracketing Greenland, were removed. When these features are present, D–O events are observed. When they are absent, D–O events are also absent. […] ice sheet elevations had a large effect on the atmospheric stationary wave patterns. Roe and Lindzen (2001) calculated the influence of an idealized Laurentide ice sheet on the atmospheric circulation, including modification of the ice sheet itself by the atmospheric circulation. A reasonable inference is that the mean structure of the westerly wind system, the standing-wave patterns, encountering the massive ice sheets is quite different from its modern value, and that more than one equilibrium is possible. Earlier modeling calculations […] involving slow changes in the shape of Laurentide and Fennoscandian ice sheets, are strongly suggestive of their influence on the climate system. […] equilibrium position for a zonal jet can be quite sensitive to the underlying boundary conditions […] pattern of mean westerlies encountering Greenland would markedly change the temperature and precipitation patterns there, as well as induce a change in the wind-stress curl over the ocean to the south […] The modification and removal of the great continental ice sheets corresponds to changes in a huge orographic feature. The primarily local interpretation implicates the wind field as the central element by which central Greenland temperatures change abruptly, and the mechanism by which larger-scale signatures would be carried to distant locations, including those induced by ocean circulation shifts under the changing wind system. Given the comparatively small contribution of the ocean to the high-latitude meridional flux of heat, it seems an unlikely primary stimulus of major climate shifts beyond the North Atlantic basin. It can readily operate as an integrator and as a transmitter of signals, but that is a different role. The similar present-day analogy (certainly not exactly the same) is something like cold arctic outflows funneled through coastal fjords, orographic precipitation accumulating in the adjacent mountains, and harshly-funneled wind seasonally ripping the fjord stratification (fresh over salt). A big difference: scale. Also, obviously the glacial mountains were made of ice (not rock), but that makes no difference to wind funneling & orographic precipitation. The analogous symmetries (differing primarily only in amplitude) between orbital & multidecadal-to-centennial timescales can be cataloged (perhaps by an industrious grad student) to expedite cross-disciplinary education & correction. Bob, I maintain a boycott of volunteering comments at wuwt & ce because not only is the validity of 1+1=2 is not acknowledged at those venues, but anyone who dares to say 1+1=2 gets dragged into ridiculously-protracted harassment. That indicates a calculated, mean-spirited agenda to thought-police towards political convenience and a willingness to viciously discourage harmonious exploration & statement of simple (but inconvenient) truths. There are interesting things to discuss, like Rial’s papers on 22ka, 100ka, 400ka, & 2Ma. I appreciate your efforts Paul. Good work on winds. Just wish I’d gotten a copy of Hans Jelbring’s thesis in 2012 when a few copies were still available. As for Milankovitch cycles, that’s beyond my personal area of interest. No offense meant either. I’m sure it is interesting, and if there’s time, I’ll read along. Blogs: I’ve seen the bad side too, but in reality, no one is as bad or as good as we tend to make them out to be. There are a great many good earnest people who participate in blogs who aren’t aware or barely aware of the things you’re calling out, and they shouldn’t be painted with such a broad brush. I was personally sidetracked/thwarted many times by a few familiar names at wuwt, but I look at it differently, I see it as more of a challenge to understand things well enough to communicate simply and effectively enough to make my points stick, especially when dealing with vastly more experienced individuals. That helps drive the work I do in doing the necessary research too. Most people everywhere don’t have the time or inclination to do the depth of research you do, and would benefit greatly from someone like you, IF you chose to talk on their level, and bring them up, as opposed to broadly knocking everyone and walking away. You have a lot to offer and I look forward to more from you down the road. Anthony Watts is not mean-spirited, IMHO, and he runs a very good blog, as does Tallbloke & Co. There are a few others whose motives are questionable/malignant, but for the rest, they’re like everyone else, searching for answers, often haphazardly, one step back, two steps forward style. Pop quiz: Does everyone know what you mean by “solar cycle deceleration”, or “the trivial decadal cyclic volatility attractor in semi-annual earth rotation”, or “an obstinate denial of basic geometry and the laws of large numbers & conservation of angular momentum”? If not, then your job as a communicator is not done. Just sayin’…. Maybe you’re frustrated that people don’t appear to understand what you’re saying. Explain everything at the undergraduate level, and explain every single phrase down to the nitty-gritty details, if you want to be completely understood. I think you’d like to have people remembering you for what you taught them, thanking you for illuminating that which was previously unknown or misunderstood, that enables them to carry on communicating effectively themselves when you’re not there, the things that they’ve learned from your teaching efforts. I’d sure like to hear how the wind fields changed in our lifetimes, or the last few decades, for example, and how the sun did that, specifically, by changes in activity, from “PV’s POV”! (but it should probably be noted that the rest are letting them get away with it). Jo Nova has no wool over her eyes, for contrast. She & Tallbloke are in a higher league of intellectual sophistication. I have time & resources only to minimally state 1+1=2. “No! 1+1≠2” and then proceeding to needlessly push incessant waves of protracted, vile harassment based on logical distortion & falsehoods. 12 rotten apples —- seems like a pretty easy problem (for a sensible host) to get rid of……. 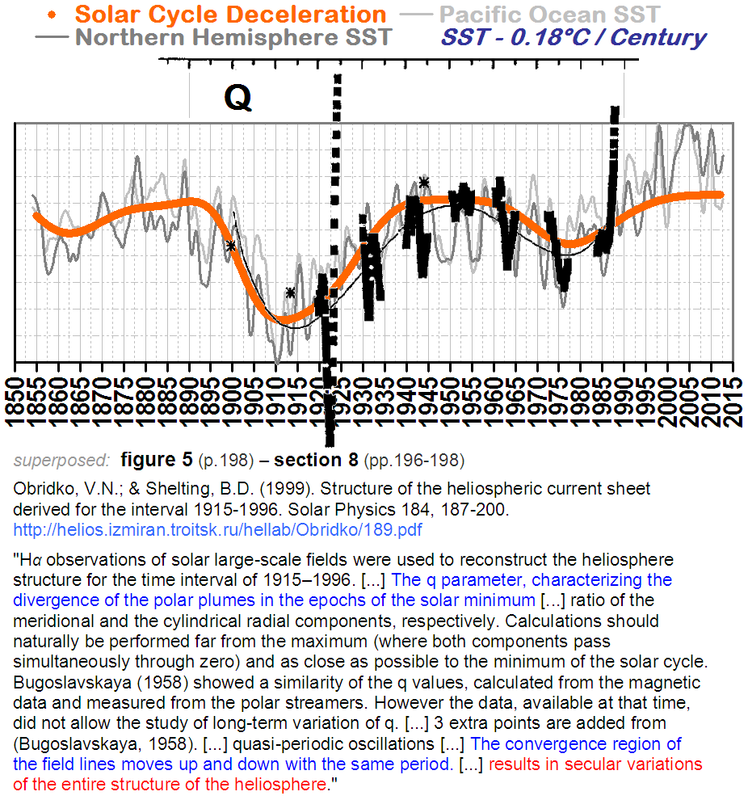 FYI, SCD (solar cycle deceleration) works the same way (it’s just on a smaller scale). Insolation-driven wind carves the path to climate enlightenment. Milankovitch theory (really the same thing, just at a different scale) is indestructible. Rial (1999) deconstructs Muller’s 1997 paper. (Yes, that Muller.) There’s a twist with almost every paragraph. Rial had the luxury of time & resources needed to craft a storyline that keeps a skeptical reader on the edge of their seat. His argument keeps looking weak, but then with every paragraph there’s a new sharp punch to remind the reader that Rial clearly has the high ground and is almost toying with peoples’ inclination to remain in ignorant disbelief by reserving ammunition for surprise assaults in later paragraphs. It’s classic. Huybers, P.; & Wunsch, C. (2010). Paleophysical oceanography with an emphasis on transport rates. Annual Review of Marine Science 2, 1-34. […] ocean circulation is ﬁrst and foremost the result of driving by the wind ﬁelds. […] although buoyancy exchange has a major inﬂuence on the structure of the circulation and is a major determinant of the transports of heat and other properties, it cannot drive the circulation in the sense of providing the energy required to sustain it. Like the Genesis story, the idea that the North Atlantic Ocean meridional overturning circulation is the major controller of the climate system has taken on an almost mythic status. Apparently, the difference between these model runs lies not with any fundamental difference in model physics, but with the choice of ice-sheet orography and the sea-surface temperatures either imposed or derived from the model. That such lowest-order changes arise from details of the model conﬁguration calls into question whether an accurate representation of the wind forcing can be obtained as a response to imposed conditions within a model. Paul Vaughan and Bob Weber. It can be seen that the speed of the polar vortex depends directly on the speed of solar wind. I think that this relationship is to be demonstrated. About circulation of this year indicates a unique ice in the Gulf of St. Lawrence. A strong solar wind caused the change in the position of the polar vortex. Currently, he is shifted in the direction of the Bering Sea, and there will increase the ice. This location also reverses the circulation in Europe: from east to west. A strong solar wind caused the change in the position of the polar vortex. ren, I must agree with you, as all the data I’ve seen this year indicates that is so. I intend to write up an article about the several SSWs we’ve had this past winter, and include the supporting evidence. However, like probably you and Paul and many others, I’ve been too busy, as I’m backed up with so much research and associated preparation for my new website. That’s why I’m so grateful that you’ve regularly posted graphics supporting the solar wind – polar vortex connection this winter. So, to put it in perspective wrt this blog article here, yes, the wind, the SOLAR wind, is also a dominant player in climate variation, and I have no doubt that our terrestrial winds are driven by solar energy gradients, insolation driven, as Paul says, and via the solar wind, as we are saying. In a fluid, both heated and cooled from above at different places, no deep overturning can occur. Only simple common sense and high school physics is needed to see that, but it can also be demonstrated in the lab. In the ocean, if density differences could drive the circulation, the abyss would eventually get saturated with dense cold, salty water. At that point the circulation would grind to a halt. Thermal conductivity of seawater is well known, and it is much too small to transport heat to depth, needed to replenish buoyancy there. Diffusivity of salts is even smaller (by some two orders of magnitude). In that kind of “dead” state only geothermal heating at the bottom could maintain some circulation, but that would be orders of magnitude weaker than what is observed. Also, there is no such thing as “upwelling”, because water masses would not go against density gradients on their own. The way buoyancy is replenished at depth is deep turbulent mixing. However, even this is measured to be orders of magnitude weaker in the open ocean, than what is needed to drive circulation at the observed rate. It is driven by breaking of internal waves over rugged bottom features and continental margins of complex geometry. The process is restricted to a small fraction of oceans and it is also intermittent at most places. However, where and if it happens, rate of vertical mixing is spectacular, three or more orders of magnitude higher than values measured in the open ocean. The places and times where and when this process kicks in are poorly known. Internal waves themselves are generated by tides and surface winds, that is, by pure mechanical energy input, which has nothing to do with thermodynamics. Density of seawater is determined by two factors, temperature and salinity. Seawater is not like fresh water, which is densest well above its freezing point (at 4°C). If salinity is high enough, density of water is highest just above freezing (around -1.9°C), therefore downwelling occurs close to the ice margin. It is exacerbated by brine exclusion (ice prefers to freeze with less salt in it, so the remaining water mass has a higher salinity). Downwelling occurs at times and places, when and where density of surface water is highest, provided another process elsewhere made room for it, that is, buoyancy at depth is being replenished by mixing somewhat warmer and/or fresher water masses downward. That’s a job for vertical turbulent mixing. Under current configuration of continents, downwelling happens almost exclusively somewhere at the ice margin. The places and times are primarily determined by salinity of water, although at some places (around Antarctica) the ice/water interface goes down to a considerable depth, and freezing point of seawater decreases with increasing pressure. At such places supercooled water masses can form (which, if they were brought to the surface, would freeze). Therefore Antarctic bottom water has somewhat lower salinity than Atlantic deep water, but its density is higher. When the two kinds of water meet somewhere around the equator, Atlantic water forms a layer above Antarctic one. Then a curious process starts. At the interface salt fingers develope, so the two water masses exchange salts without exchanging much heat. Surface water masses of high density can also be created at a higher temperature, if rate of evaporation is high and water vapor condenses elsewhere, so no rain comes back. Under such circumstances salinity of water can become so high, that it makes the parcel sink. Currently it only happens on a small scale, mostly in enclosed basins like the Red sea and over restricted areas of the ocean, like some places in the Caribbean. However, in several ancient epochs of geologic history, when there was no ice/water interface anywhere because of the lack of ice and configuration of continents was different, it was the dominant process. It took place over the Horse latitudes and used to make the abyss much warmer than it is today (something like 20°C). Under the current configuration of continents, there is no way to eliminate the ice/water interface all year round, entirely, not even under the wildest scenarios alarmists can dream up in a nightmare. Therefore location and timing of downwelling can change. However properties of downwelling water masses are not determined by “climate”, but by physical properties of seawater. That means heat content of the abyss is strictly regulated, it can neither increase nor decrease beyond a tiny bit, and if it can, it is certainly not due to the (passive) downwelling branch of circulation, but to rate of deep turbulent mixing, which also determines the downwelling flux. By the way, the proposition “the ocean’s mass flux is sustained primarily by the wind, and secondarily by tidal forcing” is not strictly true. Tides and winds have about equal share in generating internal waves in the ocean. Most of wind forcing (about 80%) happens over the Southern ocean (roaring forties, furious fifties &. screaming sixties). Its spatio-temporal pattern is pretty much fixed, but it is subject to chaotic variations. On the other hand, tides at any one place depend on the relative positions of the Sun, Moon and the Earth’s surface. That pattern repeats itself (not quite, but almost exactly) with a long period. It is 3 Saros cycles, that is, 54 years and a month. If you also want to align it to seasons, it becomes 649 years. Sea level records shorter than that are meaningless. Summing it up, one does not need “an intricate calculation” to arrive at the conclusion ocean currents are driven by pure mechanical energy input, not by thermodynamic forces. All we need is common sense, some simple input parameters like heat conductivity of seawater or diffusivity of salts and the back of an envelope. It is quite surprising such a flawed paradigm could maintain its popularity among oceanographers for so long and was allowed to dominate peer reviewed publications. It tells something about the intellectual quality of that crowd. It appears to me that Deep Ocean circulation can only be caused by Angular Momentum of the Earth’s rotation and gravitational effects from the bodies of the Solar System. The Tides are the local results of this. This is the only thing that can move all the water of the Oceans in a East to West direction, the shape of the ocean basins create deep currents in the back flows as the water in the basins slosh forward and then back. Wind driven water movement can only effect the surface waters, 200 feet of depth at most. Just the thing to pile up Solar heated waters in the Caribbean and Indonesian Seas for the surface warm water currents. Meteorology teaches us that wind is air flow from high pressure to low pressure areas, caused by heating or cooling, but pressure changes can cause temperature changes while the actual energy content of the air has not changed. Our friend ren points to the steering of Polar air masses caused by Solar wind and magnetic fields acting on the Polar Air Mass. The effects of magnetic fields and Gravity can cause changes in the depth and density of the local atmosphere and therefore the local barometric pressure as well as the temperature of the local air mass. No change in actual energy content needed. The energy comes from the waves of cosmic rays, the UV does not work. I agree completely Bob. As of late EUV readings have been in the 140 -150 unit range. (From Layman Sunspot Site) I predict if they approach 100 units or go lower the polar vortex will weaken and expand . -AO/-NAO. This (euv interaction) influences the amounts, and distribution of ozone which influences the structure and characteristics of the polar vortex. Salvatore, thanks. ren also points out that the cosmic ray energy that is modulated by the various solar interactions is part of the equation. It is really cool how that all works – no pun intended! Berényi Péter (March 15, 2015 at 11:08 pm) commentary appears to be in resounding agreement with Wunsch about the need for a correction in the field of Oceanography. Eddies and the problem of scales of motion. […] the intense turbulence superimposed on the large-scale structures contain 90–99% of the kinetic energy of the ﬂow […] Two separate problems arise: In the presence of eddies, climate records are noisy—making it difﬁcult to identify and extract climate signals of interest (Wunsch 2008)—and the eddies can have important, even dominant, inﬂuence on the nature and behavior of the much larger-scale space-time property structures. […] paleoproxies tend to reﬂect only properties near the surface or the sediment-water interface, making it difﬁcult to constrain the conditions in the interior. […] to make rapid changes in the ocean circulation, the wind ﬁeld is the most efﬁcient mechanism—surprisingly, very high frequency ﬂuctuations (timescales of days), will be felt almost instantaneously at the sea ﬂoor, much more effectively than slower changes for which the stratiﬁcation intervenes and greatly slows the abyssal response. The modern ocean circulation is believed to be baroclinically and barotropically unstable[…] Thus an increase in the wind strength, driving the large-scale ﬂows harder, would not lead directly to an increase in the circulation strength, but merely a faster transfer of wind energy into the geostrophic eddy ﬁeld. Something like this behavior is seen in models of the Southern Ocean […] where the transports do not respond in any simple way to changes in wind strength. High-latitude convection and the formation of dense water that sinks to intermediate or great depths is one of the central elements of the ocean climate system. Unfortunately, the existence of this ﬂow, which is not in doubt […] led to the misconception that the ocean was a convective system like the atmosphere, but one with the top and bottom interchanged. The atmosphere is heated from below and cooled above as in the classical Rayleigh-Benard situation. A ﬂuid such as the ocean, which is heated and cooled at the same level (near the sea surface), has very different physics, which is perhaps best understood by asking the question: If deep water forms at the sea surface and sinks to the sea ﬂoor, why does the ocean not simply ﬁll up with that cold-dense water? How buoyancy forcing acts in concord with other forces is the essence of understanding the circulation. The only simple inference one can make is that, although buoyancy exchange has a major inﬂuence on the structure of the circulation and is a major determinant of the transports of heat and other properties, it cannot drive the circulation in the sense of providing the energy required to sustain it. Absent wind-ﬁeld estimates, it will be difﬁcult to produce quantitative theories either of the large-scale ocean circulation or of the small-scale mixing that helps determine it. […] among the many hypotheses would be those that make the ocean circulation the “trigger” of climate change, with such triggers lying largely in the North Atlantic, as opposed to possibilities that the ocean responds primarily to disturbances from the coupled atmosphere and ice distributions and that cause and effect are largely global. How did you arrive at this belief? ? ? Berényi Péter ? ? What do you say to this ? ? A strong solar wind causes the south polar vortex is centrally located in the stratosphere and the temperature drops quickly. There is also no waves in the stratosphere. Circulation in the north and the south is different (in low solar wind) due to the magnetic field. Cosmic radiation energy is concentrated around the magnetic poles. Note that because of the high energy GCR easily enters deep into the atmosphere. 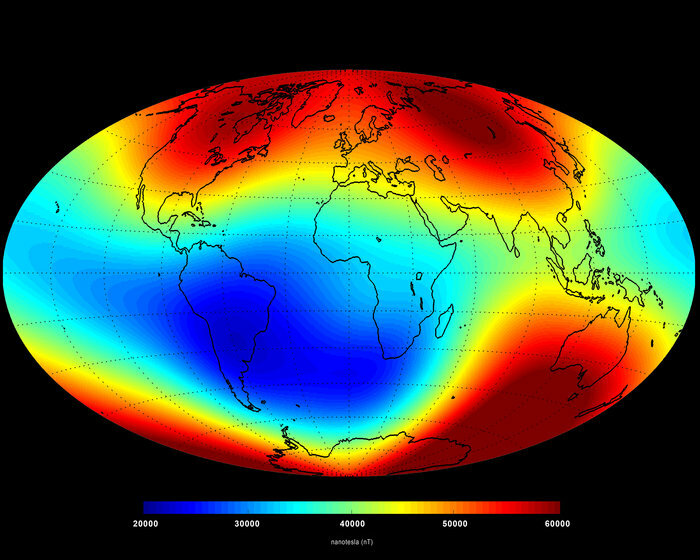 In the area of the ozone greatly increases the number of collisions and secondary radiation. Is very high up to about 10 km. Most galactic cosmic rays have energies between 100 MeV (corresponding to a velocity for protons of 43% of the speed of light) and 10 GeV (corresponding to 99.6% of the speed of light). The number of cosmic rays with energies beyond 1 GeV decreases by about a factor of 50 for every factor of 10 increase in energy. Over a wide energy range the number of particles per m2 per steradian per second with energy greater than E (measured in GeV) is given approximately by N(>E) = k(E + 1)-a, where k ~ 5000 per m2 per steradian per second and a ~1.6. The highest energy cosmic rays measured to date have had more than 10^20 eV, equivalent to the kinetic energy of a baseball traveling at approximately 100 mph! I recall the Earth’s magnetic field. How important is the wind you can see after the temperature of Humboldt. La Nina is coming. @ren: what on earth is the magnetic field up to now? Although almost 90% of the observed magnetic field can be approximated by a dipole, the 10% left over, called the non-dipole field cannot be ignored. In places it can be large relative to the dipole field, thus altering noticeably the shape of the observed field. This is especially true in the vicinity of the North Magnetic Pole, with important consequences. In order to appreciate how the non-dipole part of the magnetic field distorts the overall shape of the magnetic field it is important to understand what the dipole field looks like. The three diagrams illustrate the following points. The real magnetic field is quite different, as can be seen in the next set of three diagrams. Paul Vaughan on Milankovitch theory. My question was, how stable the wobble and tilt is. If a small piece of bubble gum stuck to the side of a child’s toy top, can make it wobble out of control. What would giga tonnes of ice do to a spinning globe? The vast ice sheets unevenly arranged around the globe during the glacial times has no effect on the size of the wobble? Did find someone else who looked into it and found it is true. Sabadini and Peltier  have constructed a physical model in which they found that a net polar wander could occur as a result of the periodic forcing by active glaciation and deglaciation. This phenomenon is illustrated in Figure 1. Previous work by McElhinny  and Jurdy and van der Voo  have concluded that the amount of true polar wander (TPW) during the last 55 m.y. has been quite small, about 2 ø. However, recent reanalysis of paleomagnetic data by Jurdy  and Morgan , using a reference frame based on hot spots, have revealed that TPW of between 10 ø to 15 ø had occurred since the Cretaceous. Furthermore, Morgan has proposed boldly that, in fact, 5ø-10 ø of this polar wander must have taken place in the last 10 m.y. I would suggest that in addition to the mechanical forces already outlined, even quite small changes in LOD will cause quite a lot of turbulent mixing on the rough ocean floor. When the Earth changes speed, the ocean doesn’t, until friction and turbulence has imparted enough energy to it. Hi Paul, sorry, I can point to no wonderful paper by an accredited authority to hang my statement on. .
Are we maybe saying the same thing (at least sort of) in different words? Isn’t (at least some of) this implicit in notes of Carl Wunsch & Berényi Péter? Let me try to provoke comparative perspective with an eye for equivalence. Low-frequency LOD’s shaped by SCD (solar cycle deceleration). Insolation-driven wind evaporates (water to vapor), mixes (water, vapor), blows (ice, precipitation) & otherwise redistributes water (& water state). It “pumps” in general. It does this both meridionally & vertically (Rial’s 2012 fig. 1, 7, 11 combo = analogy). Maybe what DD More says (March 16, 2015 at 10:44 pm) is similarly implicit. For sure there’s more than one way to say the same thing. Maybe the point of the various quoted notes above is to correct fundamental mainstream misconceptions blocking recognition that AMOC pacing is governed by insolation-driven wind. Maybe (?) sunspot integral informs about accumulated heat? Maybe (?) SCD informs about (meridional & vertical) exchange rate? If it hasn’t already, maybe it will start to become intuitively clear to community luminaries after quickly fathoming big picture analogies with Rial’s (2012) figures 1, 7, & 11. I would say it’s mostly the same thing but framed differently. Is anyone reading Rial (2012)? And do you see (benthic-pelagic, south-north)?? Will rapidly accrete the ice around Antarctica. Let’s see how it looks ionization atmosphere during solar storms. This morning we’re undergoing a G1-class geomagnetic storm. Oulu is sharply down right now. The IMF was 35nT a few minutes ago, with Bz as high as -28nT during that spike and 600km/s solar wind. Hemispheric power at both poles went from 9 GW to 90 GW very quickly, triggering auroras down to the US-Canadian border (hemispheric power is a function of solar wind speed & density). Le Mouël, J.-L.; Blanter, E.; Shnirman, M.; & Courtillot, V. (2010). Solar forcing of the semi-annual variation of length-of-day. Geophysical Research Letters 37, L15307. Why does the mainstream think the synchronization can be independent of the coupling??? Don’t they realize how silly this implicit climate modeling assumption looks? These people need to learn to get a whole lot more serious about accepting observation. I think Wunsch is right that a lot of the modelers have theoretical backgrounds and aren’t even remotely sufficiently aware of what has been observed. He suggests it’s a cross-disciplinary education gap and I wholeheartedly agree. I would add that nasty politics has become a strong stint artificially holding the gap open. Paul V: Are we maybe saying the same thing (at least sort of) in different words? Hi Paul, we probably are. I was just adding LOD into the mix because the internal sea-bottom waves mentioned are only partly due to tidal action. There is also (I believe) and external celestially driven component to changes in LOD, which may well be acting via the solar wind as you mentioned. When computer says A while observation says B, climate science sees B as the problem. Hemispheric power right now is 110GW at both poles. http://services.swpc.noaa.gov/text/aurora-nowcast-hemi-power.txt Feel it? So for mainstreamers bothering to fathom the differintegral structure Rial (2012) comparatively illustrates (benthic-pelagic south-north analogy), the lesson is simply about coupling of meridional to vertical. It’s dead simple. Don’t forget that methane & CO2 have the same spatiotemporal relationship. It seems to me that mainstreamers are having difficulty accepting the OBSERVED frequency modulation of the turbulent flux. Probably inadequate depth of conceptual understanding of aggregation fundamentals is the root of the ignorance (and consequently the sustained political deception thus facilitated). I would say insolation-driven wind & ice extent (including height for land ice). It’s about how turbulence from meriodional gradients entrains the depths & heights (ocean mixing & nonlinear glacial orography). It appears possible that we’re looking at the same thing from differing perspectives. SCL is the integral of SCD. SCD is the derivative of SCL. It’s all the same thing, just on a different scale. Now even accelerate the jet stream. Will also wind blew strongly at the level 700 hPa. If the reader doesn’t see this today, hemispheric power was peaking around 115GW w/90%+ aurora. Polar Cap Index is also showing a major spike from the CME. Cloudy here so unlikely to see anything. Bob and Ren – please expain the likely effects of the severe geomagnetic storm on weather and earthquakes in simple terms. Many thanks in advance. 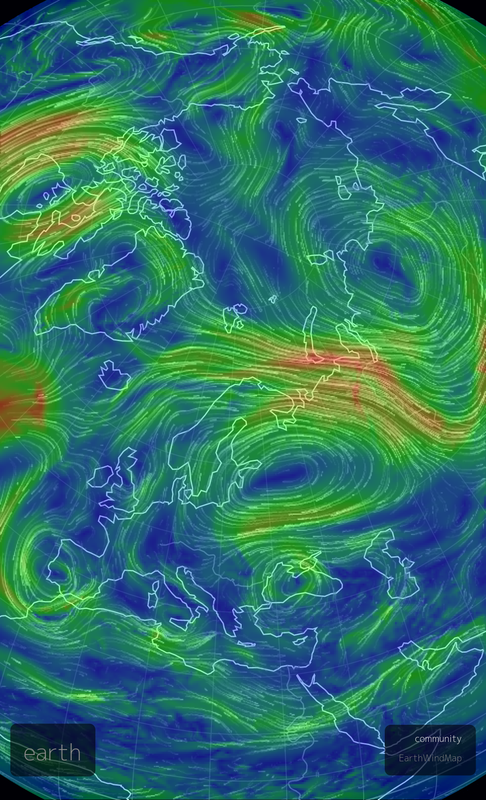 Radioactive radiation of the Arctic Circle in the storm is very low. Increases directly after a strong explosion (gamma). Macrobeak, strong magnetic activity of the sun changes, both up and down causing a strong movement of magma. Probably soon we shall see. I expect an uptick in geological activity due to the k8 geo magnetic storm. Ideally an AP INDEX less then 5 for several months with a spike to 300 or higher would make me more confident, but nevertheless this spike should result in some increase in geological activity over the next few weeks in contrast to the few weeks prior to this event. Time will tell over the next few weeks. Though appealing in its simplicity, the ocean conveyor-belt paradigm has lost luster over the years […] the ocean’s eddy field, unaccounted for just decades ago […] figures prominently in the dismantling of the conveyor-belt paradigm. Indeed. The ocean is only a thin layer on the surface of Earth, its horizontal extent is 3+ orders of magnitude larger than its vertical one. Therefore it is tempting to model its currents as 2D flows, with two separate layers perhaps (surface + abyss). That’s what the “conveyor belt” is about. However, there is a fundamental difference between the math of 2D and 3D flows. In a turbulent 2D flow energy is transferred to ever larger scales (inverse cascade), so small eddies tend to disappear with time. Such a flow can not support turbulent mixing. On the other hand, 3D flows do the opposite, kinetic energy is transferred to ever smaller scales (forward cascade), until the Kolmogorov scale is hit. That’s how turbulent mixing, the engine behind ocean currents works. Therefore the 3D nature of the flow can’t be ignored in models. Unfortunately the very existence of forward cascades makes numerical modelling of a turbulent flow mathematically intractable. Paul, I agree. Wind does most everything! Try to understand, NOI This earth was designed and constructed to be non understandable to whatever is the current top predator! How marvelous..
Polk at it is fine for trying to understand. We gots to consider the UN-understandable. How dey do dat? Andrew (March 20, 2015 at 9:51 pm) brings up a big topic. The various SAM reconstructions measure different things but try to go by the same name. Some of them are dominated by tropical coupling to SH fall & winter whereas others depict what I would consider a more true SAM (more devoid of tropical contamination). This is an advanced subject for people who understand that chaos in climate is NOT temporal but rather spatiotemporal. New methods need to be developed to aggregate sensibly across the multiscale turbulence to isolate attractors according to a spatiotemporal version of the law of large numbers. The tricky part is the boundary conditions. Some of the features do have simple symmetries and that is why some minimalist progress is feasible, but it gets tricky picking out the celestial contamination. For example the semi-annual oscillation in the Southern Ocean picks up the stratospheric volcanism and this beats with the nearest QBO & BDO harmonics to nonlinearly contaminate the sunspot integral signal. The beats give a penta-decadal signal & another wave with a period of ~83-85 years. Their harmonic mean is ~64 years. But none of these lunisolar beats are of core interest. They represent contamination of the true external signal of insolation, which is the only thing that drives anything. The lunisolar stuff just stirs. A project for someone who wants to get to the bottom of this is to look at the geographic alternation of VEI clusters associated with decadal ENSO. I would be d*mned surprised if the military doesn’t already have (highly classified) detailed animations of this. If I had serious time & resources you can be D*MN sure I’d have animations of it too. I think this topic is too advanced for serious blog discussion. In part I say that to (amicably!) provoke. Remember that the ~83-85 year signal is coherent with multidecadal CAM (core angular momentum) and the long JEV cycle. I’ve been digging into the SAM reconstruction literature while revisiting old notes. A cautionary reminder is worth repeating: the various SAM reconstructions do NOT measure the same thing, so when you say “SAM” and I say “SAM” and someone else says “SAM”, we’re DEFINITELY NOT talking about the same thing, so we’re going to be having some uphill work communicating about this for awhile, at least until someone does better classification. I don’t really expect much of this to make much sense. We’re probably not going to be able to sensibly discuss this until vastly superior classification is available. It’s not a matter of this SAM or that SAM being “right” or “wrong”; rather it’s a matter of them conveying different info. Some of them are telling (way) too much about tropical coupling to SH fall & winter IMO (and so should be called something else). I’ll be digging at this more for sure…. I’m already convinced there’s something quite misleading in this new paper (because what it calls “SAM” isn’t SAM), but this is probably a useful opportunity for everyone to start studying up, so it might be useful stimulus despite whatever. So there’s your nutty assumption: There’s a wall at 20°S, neatly compartmentalizing everything south of it. You have to believe that to go with the “Coherent multi-decadal variability between the SAM and NH and tropical surface temperature” suggested by the grand new multidecadal “wisdom” to which Andrew has alerted the community (also announced a few days ago by Judy Curry). So what we have is more contamination of clear thinking if this Impenetrable Wall of 20°S becomes the meme-base …which I believe is the plan of a certain group of lukewarmist distortion artists infected with a wild lust to artificially engineer monstrous uncertainty. I’m pretty sure I already know the defense they plan for The 20°S Wall …and I assure everyone it will be effortlessly taken down in one lazy shot (that’s how weak the defense is). It’s a Livina & Lenton -class screw-up. What will be really funny (and nakedly indicative of shallow quantitative “reasoning”) will be observing who buys into this stuff. All of the “data” before 1945 is based on the false assumption that there is a wall at 20°S preventing northwards coupling. So take a minute to think this through. The new “wisdom” uses “data” assuming absolutely no north-south atmospheric connection (across 20°S) to prove a north-south atmospheric connection (across 20°S). This could be the material of stupendous comedy if someone who deeply understands finds time to write up a scathing exposure. Well, that’s the state of climate science theory for you in a nutshell. Seeing what they want to see and ignoring everything else. “An dominant”? Sounds awful. Careful with the copy-paste word replacements. SAM is the bigger thing upon which that multidecadal pressure wave rides. A key thing to note is the high latitude SH spatiotemporal pattern. The ~60 year wave does not travel at an equal pace in each sector. In the Indian sector only ~60° is covered in 1 cycle, whereas the Atlantic cycle covers ~180° and the Pacific cycle covers ~120°. Inattention to asymmetry is the root of the confusion in the SAM reconstruction literature. False assumptions. False assumptions. False assumptions. That’s the most important weapon in the arsenal of dark agents. Antidote: Disarm. First point out: assumption of uniformity fails harshly. The Shaviv article is refreshing. I especially like how it shoots down false modeling assumptions. PV: another case of ‘shoot the messenger’ by the climate alarm crew, LOL. Cherry-picking their ‘evidence’ is the M.O. of promoters of man-made climate alarm. Anything else gets ignored or attacked, all the more so if it has a strong scientific basis. A major earthquake struck early Monday morning in northern Chile. The National Seismological Service at the University of Chile initially listed the temblor at a magnitude-6.3. The U.S. Geological Survey listed it as a magnitude-6.4. The temblor’s epicenter was located 48 kilometers (30 miles) east-southeast of Putre, Chile, at a depth of 128 km (180 miles), the USGS reported. It was near the borders with Peru and Bolivia, and occurred at 12:51 a.m. local time. There’s a fatal problem with ethics on this file. It’s thoroughly sickening and it needs to be corrected.